Well, you know I have to chime in whenever you post about anything Swedish, e.g., “Flying Jacob.” This looks delicious, Jane! Swedes eat aepple kaka with vanilj saas, not this stuff.Is that what you’re waiting for? This looks like one of those deserts, that I would definitely eat the crust first!! It looks delicious – – the way the edges are a little darker is my favourite part. I love the idea of the crust making itself. That’s over half the battle with pies! totally! this is just sooo much easier…different, but still so yummy. totally worth the lack of labor! love the idea of not having to make a traditional crust. I steer away from making quiches with crusts (I do a great crustless one), same with homemade pizza – I love gorgeous topping on pita bread rather than making pizza dough. Your “crust” on this sounds very quick and easy which suits me just fine. I’m making this today, without a doubt!! The recipe is very easy to make. I have all the ingredients so its simple to start right now. Thanks for the delicious recipe. I love this! Apple pie is my husband’s favorite pie. I’ll go ahead and say “thank you” on his behalf. Nomenclature is a seriously big word Jane. I saw this on Pinterest and decided to give it a try. Mine came out more like a cobbler…don’t know what I did differently. It’s still yummy, though! Thanks for sharing! Chase and I made this last night — so yummy, SO easy! The “crust” is more of a cookie — but who doesn’t like cookies! I will make this again for sure! This is really good! And absurdly simple. I made it with a 2.5 and 6-year old helping and it still came out just fine. Thanks! I’m not much of a pie person, but I’m definitely going to make this one! I can’t tell from the photo, do you peel the apples before slicing them, or not? excellent question! i’ve updated the recipe, but to answer you directly, yes, peeled…but pat said “loosely” which means don’t let the peeling stress you out 😉 but, yeah, peeled is good! Thanks Jane, I made it tonight for my family and two guests. It was a huge hit! I made this yesterday. I found it a bit too sweet. Next time I will use tart apples and less sugar in the batter. it’s so funny you should say that! the first time we had it, it was made with macintosh apples. nate loved it. then I made it with honeycrisp apples, and nate said it was too sweet (I actually didn’t think it was too sweet, but there are definitely things at times nate finds sweet that I don’t). Think you can substitute apples with other fillings? Cherry pie? peach? wow, I’ve never even thought of that – but that’s a great idea! I feel like peaches would work great. I don’t know if it would be great with a premade pie filling, might get too goopy, but I think it’s definitely worth trying with other fruits. great idea! I am all over ‘easier’, too. I prefer a sugary, crisp crust on cobblers, that’s how my mother made them (a rolled dough topping). I am planning to use frozen blueberries instead of peaches. 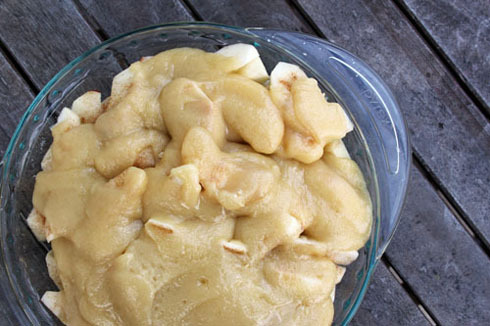 I’m keeping my fingers crossed this will be very similar to the cobblers from my childhood. ooo, let me know if it’s similar – would be interested to hear! About to try this! Looks amazing! Found this today and immediately made a couple of peach pies with it with my home canned peaches. So good and so quick and easy I’ll be making several more with other fruits in the next few days. Thanks!! I don’t know why I hadn’t thought of using other fruits with this technique – so glad you commented! thank you! Made this last night. Batter sank to bottom and remained moist, never got cookie-like as described even after increasing bake time, but we liked it anyway. Prolly be really good next day too, thx for sharing this recipe! I’m so glad you loved it, and I’m also glad it converted to GF – awesome! Silly me! I’m so used to seeing T for butter that I did hat instead and wondered why it wasn’t liquid-y . . . Maybe that is what someone else did above. I’m crossing my fingers that it sill turns up well, should be more like a cookies or cobbler. it will be a surprise! I will Ty it again and do it correctly. It smells pretty fantastic though. Hi! Have been making this pie for years – but changed it just a little for our own tastes. My daughter requests this for her birthday “cake” every year. Try this: instead of 1 cup sugar, try 1/2 cup white sugar and 1/2 cup brown sugar. It makes it taste a little caramelly – and really adds to the flavor. I also add 1/2 teaspoon cinnamon to this same topping mixture. Hope you try this! love the idea of doing half brown sugar – thank you, pamela! I first got this recipe over 35 yrs ago at a school potluck dinner. My son is coming in and this is one of his favorites, but I couldn’t find the recipe and looked up Sweedish Apple Pie and this one is it. My recipe called for chopped walnuts in the crust, just adds to the already delicious flavor. Thank you!!! I panicked when I couldn’t find the recipe. you’re welcome, and I’m so happy you were able to find it here! and I also love that you called it swedish apple pie, too – that makes me happy! love these old recipes! I made this Swedish apple pie with a few cranberries added and it came out perfect. The cranberries added a touch of tartness that helped to balance out the sweetness. I’m so glad it came out perfect – and I LOVE the cranberries idea! YUM! if you try with other fruits, please let us know how it goes! maybe the totally non-sensical name just makes it more beloved! 😉 and yes, totally legit for a pie contest! haha! I tried this several times now and I keep finding ways to improve or modify it with different twists. I tried a few frozen cranberries and it added a nice tartness. I also tried a few walnuts and pecans. Adding a few pear slices also adds another textural layer. My family and friends all love this pie. I also tried substituting Bisquick for the flour. I’m Swedish and my mother has been making this same recipe for 50+ years. There’s a Norwegian apple pie recipe that my grandma had. I put melted butter at the bottom, add sugar to the bottom of pan, and also to the top to form a crust! How many apples do you use? P – that is a great question, I can’t believe I didn’t give any guidance on that! I will go update the recipe. It’s generally 4-7 apples, depending on how big they are. I start with 4, then slice more apples as needed! I have made this with peaches, apples & pear combo, blueberries(about 6 ounces), cherries(about 6 ounces). You could make it with just about any kind of fruit that you like. I just made a vegan version, which looks great, but I just took it out of the oven. I will post to let you know how it tastes. For right now anyway, I used a stick & a half of earth balance butter & I substituted the egg with 1 Tbsp vinegar, & 1 teaspoon of baking soda. I love that you’ve done other fruits and it works, the sky is the limit now! yum! oh, and definitely curious about the vegan turnout! Made this recipe years ago..
yay! I have had a few recipes on my site like that, where someone lost it and found it here…that always makes me very happy. you’re welcome! happy baking! 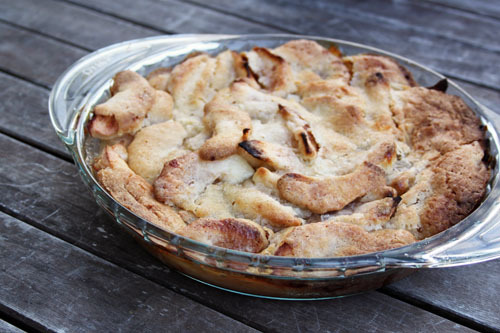 Really tasty, like a cookie crust, much better than typical cobbler crusts. I will be making this recipe with peaches next time. Thanks for the recipe. oh good, so glad you liked it! and peaches will be divine! Wonderful! That makes me so happy! Makes it own Crust Apple Pie « I'm Hungry!